1997 Alex Ross Uncle Sam #2 Page 15 Original Art and Promotional Poster Group of 2 DC. Uncle Sam infected by amnesia ambles through a city and his own memories in this two issue series fully painted by Alex Ross. This group contains a painted page from issue #2 featuring a scene from history... "Shays' Rebellion, " whereupon 1,000 men stopped the seizure of indebted farmers' property. It is watercolor over graphite on illustration paper with an image area of 12" x 18.5" and signed by Ross in the lower margin. Matted below that is an image from a printed promotional poster for the series. 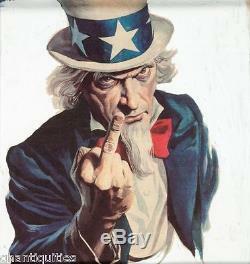 This same image was used as the art for the Uncle Sam F.
T-shirt design by Graphitti Designs. The print measures approximately 7.5" x 8.5". These great pieces are glass front framed to 27.5" x 44" in a heavy wooden frame. Alex Ross (born January 22, 1970)is an America comic book writer and artist known primarily for his painted covers, interiors and design work. He first became known with the 1994 miniseries Marvels, where he collaborated with writer Kurt Busiek for Marvel Comics. He has since done a variety of projects for both Marvel and DC Comics , such as the 1996 miniseries Kingdom Come, which Ross co-wrote. Since then he has done covers and character designs for Busiek's series Astro City, and various projects for Dynamite Entertainment. Alex's feature film work includes concept and narrative art for Spider-Man and Spider-Man 2, andDVD packaging art for the M. He has done covers for TV Guide, promotional artwork for the Academy Awards, posters and packaging design for video games, and his renditions of superheroes have been merchandised as action figures. Hisrendering style, his attention to detail, and the perceived tendency of his characters to be depicted staring off into the distance in cover images has been satirized in Mad magazine. Because of the time it takes Ross to produce his art, he primarily serves as a plotter and/or cover artist. That's despite the fact that many outstanding painters are at work in today's comic books. WE'LL PAY CASH FOR YOUR COMICS, CARDS, & COLLECTIBLES! WEST COAST OFFICE: 253.941.1986 EAST COAST OFFICE: 609.286.2954. Vintage Comics, CGC Comics, Comic Original Art, Comic Collections. Sealed Sports Boxes & Cases, Vintage Singes (70's and Below), Modern Singles (RC's, Autographs, Relics etc), Graded Cards (Beckett, PSA, SGC), etc. Sealed Gaming Boxes & Cases, Gaming Singles, Magic The Gathering, Pokemon, Yugioh, Cardfight!! Sealed Non Sports Boxes & Cases, Complete Sets, Singles, Star Wars, Star Trek, Garbage Pail Kids, TV Show Cards, Americana, Pop Century, etc. Certified Memorabilia (PSA, JSA, UDA, Stenier, etc,), Celebrity Signed Photos & Memorabilia, Game Used Items Jerseys, Balls, Bats, etc. LET US KNOW WHAT YOU HAVE. In order to receive a quote on your item(s) just shoot us a message and we'll contact you as soon as we can. For the fastest response and most accurate quote, be as specific as you can, regarding quantity and condition in the description. Our other super items you may like! This listing is currently undergoing maintenance, we apologise for any inconvenience caused. 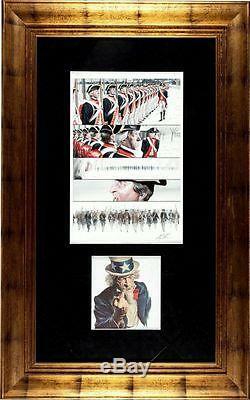 The item "Uncle Sam Promotional Poster Group of 2 By Alex Ross Page 15 Original Art" is in sale since Monday, December 07, 2015. This item is in the category "Collectibles\Comics\Original Comic Art\Drawings, Sketches". The seller is "pristinecomics-pristineccg" and is located in West Coast Sports Washington. This item can be shipped to United States.